Listen Up! 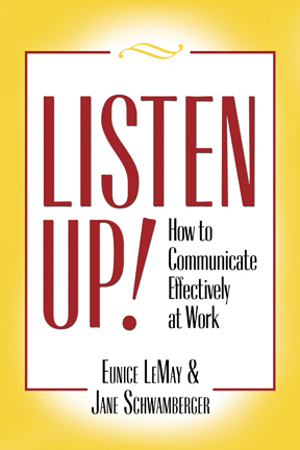 How to Communicate Effectively at Work shows readers how to achieve greater cooperation and reduce stress at work as well as in personal relationships. Listen Up! addresses listening as the key to effective communication. It presents easy-to-apply skills that will help readers to communicate successfully across gender, cultural and generational lines. In addition to basic written and verbal communication skills, it talks about the three workplace behavioral types and three learning types and how they impact communication.